Hi there! I'm Rebekah and I am the face behind Florologie - with the occasional help of free-lancers on event days! I am a follower of Jesus, married to Nick, and a lover of all things nature. A walk in the woods or day kayaking the canal are my favorite things! ​ I am one of those people that fell into starting a business. When I was in college, I made one flower garland that started this journey for me. I listed it on Etsy and got lots of requests for them. I found myself making all kinds of alternative floral products for weddings and teaching myself principles of floral design. 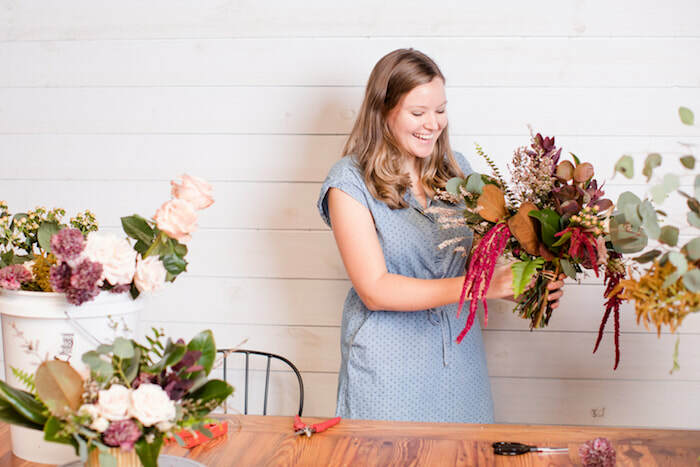 After creating florals for so many weddings, I realized it should be my job! Even though this isn't where I expected to find myself, I'm SO glad this is where I am. I love being the person behind Florologie and I am committed to quality and originality in my work and the needs of my brides. With every wedding or event, my goal is to first understand what the bride/client is dreaming of for their event, then translate that feeling into florals. I design with YOU in mind and I spend hours pouring over every floral design making sure that it is the best it can be. My client always gets to approve the design scheme, so you can be assured that the end design is truly just for you!